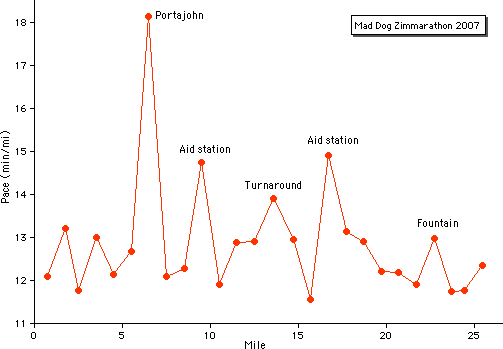 The winner of today's Mad Dog Zimmarathon shatters the course record by 25 minutes! Of course, the MDZ has only been run once before (29 Aug 2004) ... there's only one entrant in both cases (me) ... and there are no prizes, no medals, no t-shirts, no volunteers, no course marshalls, and no official sanction for the event. No matter! It's all good — even if the bruised toenail that I come home with falls off next week. Three cute bunny rabbits scamper away from Rock Creek Trail in Kensington as I approach. One is so well camouflaged that at first in the semi-darkness all I see is a white powderpuff tail hopping across the grass. After an hour I start to feel significant intestinal distress, so during the seventh mile I inspect a portajohn at Veirs Mill Park. (It's amazingly clean; the maintenance log inside says it was serviced only yesterday.) What might have caused my infirmity? As I approach the Parklawn picnic area (mile ~8.8) a jogger asks which direction leads to Washington and which to Lake Needwood. Two hours later on my return trip (mile ~17.4) she reappears and poses the same question. Inside the base of a hollow tree near Aspen Hill Park last evening I cache two liters of Gatorade and a cylinder of Pringles potato chips. I refill my squeeze bottles outbound (mile ~9.5) and grab a handful of crisps, then hide the goodies again. Homeward bound (mile ~16.7) I repeat, finishing off the electrolyte liquid. But more than half of the chips remain, so I leave the can prominently on top of the park water fountain in hopes that other runners in need will eat. I try to tell people about them, but everybody I meet is wearing headphones and can't hear me. Too bad! "Sue's Spot" (mile ~10) — the informal memorial grove in honor of Sue Wen Stottmeister, murdered here in 2001 — is strangely silent, empty of flowers and marathon medals that used to be placed there. Is it no longer being maintained? Big packs of runners from MCRRC's marathon training program blast past (miles ~10-12), embarrassing me when they catch me walking, especially since so many of them seem to recognize me and greet me by name. "Are you the fellow who does that wiki?" a jogger asks me as I approach Lake Needwood (mile ~13). I confess, shake his hand, ask his name — Ed Dougherty (?sp?) — and learn that he's training for the Marine Corps Marathon and appreciates my notes on Rock Creek Trail. Ed continues his run southward, and we meet-and-greet again an hour later near Dewey Park (mile ~18.2) as he's heading back. The weather today is unseasonably cool and dry, with temperatures in the 70's. Even so my shirt is sweat-soaked within a few miles. A bit after the turnaround at Lake Needwood (mile ~13.5) I take the nylon singlet off and tuck it into my fanny-pack belt, after which I'm significantly more comfortable. A big deer on the path startles me at Parklawn (mile ~17.5); it bounds away into the woods. Approaching Ken-Gar Park (mile ~19) my legs begin to get tired. Before that point my pace is slow enough that I feel surprisingly fresh. I contemplate making another portajohn stop but see from my watch that I've got a chance to finish in less than 5:45 — so I trot onward. After last Saturday's stressful experience of dehydration on a 16+ mile jog I deliberately try to drink more, and to take electrolyte capsules and salt-rich energy gels. It seems to work.